The wall is the materialized representation of this idea of a border. In English people call it a “fence” and in the U.S. that fence means “defense”; something that in American minds brings protection. Interestingly enough you would have to ask them, “Protection from who or what?” And this same wall or barrier or fence means an “offense” to Mexicans. The U.S./Mexico border is falling apart. Like Chipotle Swiss cheese, it is shot through with gaps, holes, lacunae, erasures, and stretches of emptiness. The border exists—but at times its existence seems to collapse beneath the weight of its own sovereignty. How does the border both exist and not exist at the same time? How does it manage to appear in strategic locations and disappear in non-strategic ones? Why do we think of the border as having a fixed and permanent national identity instead of a contingent and temporary one? Like every national myth, the U.S./Mexico border began life as a collective act of imagination. Established by the Treaty of Guadalupe Hidalgo in 1848, the border between the two countries was born as an implied line in the sand, a mere projection on paper inspired by the territorial aspirations of the United States government, legitimized by its military victory, negotiated by diplomats and mapped by cartographers and surveyors. In its infancy, the border consisted of a scattered series of perishable markers set miles apart in the desert. As a slight trace on the surface of the earth, its claim to reality was tenuous at best. But a confluence of historical events helped harden the border over the late 19th and early 20th centuries, including early crises like the genocidal war against the Native population, the rise of border violence during the Mexican revolution and the racial fear of the other that resulted. Capitalists and capitalism seeped into the area and economic interest began to grow. To control the flow of goods and property became the state’s highest priority. It wasn’t until the 1920s that the border began to evolve into a militarized defense meant to hold the line against illegal immigration. Today, the 1,989-mile-long border between Mexico and the United States exists in the guise of border agents, fences, boundary markers, walls, narrow strips of raked soil, sensors, drones, camera traps, customs houses, laws and statutes whose primary purpose is to control the flow of illegal immigrants, drugs and to prevent terrorist invasion. Such a view opens up a way of thinking about the border as a messy, permeable zone of mutual influence rather than a hardened barrier standing between two monolithic, diametrically opposed bodies politic. Gómez-Peña’s alternative border is not the focality of classic Cartesian space drawn with receding lines of perspective and mechanical explanations of colliding physical bodies. Rather, it is a blurry aerosol mist hovering without definitive references or a corresponding sense of depth; not as a structure built onto the landscape but as a wound carved out of the earth. Gómez-Peña’s “new world border” is a cracked mirror reflecting our own noir images back at us in a disturbing kaleidoscope of self and other; a bathymetric map projected onto dry land, familiar yet richly strange, proportionally correct but upside down and inside out. 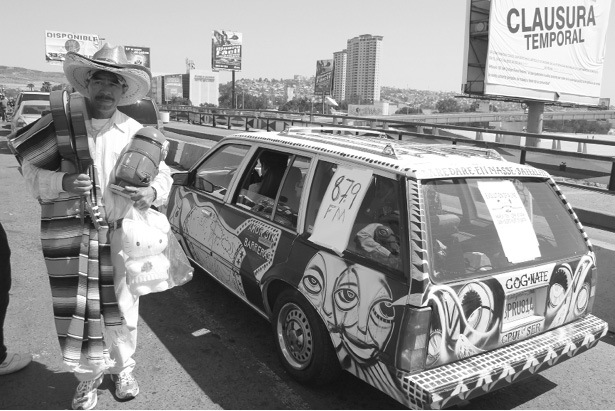 Through the production of his multiple hybrid border identities, shamanistic performances and poetic and non-academic writings Gómez-Peña has de-constructed the border and successfully detached it from the idea of a space defined by state control where nationalistic forces must always override local influence. Peter Schneider’s 1983 novella, The Wall Jumper, tells the story of Kabe, a West German whose fixation with the Berlin Wall turns him into a serial border jumper. Fifteen times, Kabe successfully jumps the Wall from West to East Berlin even as East German jumpers risk being shot. To outside observers his provocations seem void of ideological motivation and without political meaning. In fact, Kabe’s unprecedented jumps are so far off the ideological, political and legal maps that neither West nor East know what to do with him. After each jump the East Germans return him safely to the West. West Berlin authorities consider bringing charges against Kabe, but by the logic of Cold War politics the West never recognized the existence of the Berlin Wall as a sovereign state border. Therefore, Kabe had “illegally” crossed a state border, which didn’t exist. A final solution to the conundrum of Kabe is to have him declared incompetent. Nonetheless, with each jump, Kabe realizes a stronger sense of the perfection of his own gestures until they gradually take on the contours of an unintentional border crusade. But what does it mean to deport oneself in the name of an ambiguous protest against reality? What does it mean to launch yourself over sovereignty’s threshold into the belly of a state that bureaucratically vomits you back each time? Is there a larger meaning behind Kabe’s actions? Like Joshua at the Battle of Jericho, does Kabe the Wall Jumper think of himself as a shaman whose wall jumping performances aim at collapsing the Wall under the weight of its own political, legal and moral contradictions? Or was he simply ahead of his time? Twenty-five years after its fall the Berlin Wall has become a lucrative tourist attraction. Berliners cross freely where it once stood, a victim of its own temporal limitations. The Wall no longer exists except as an historical artifact worthy of preservation in museums. For young Berliners the Wall is neither controversial nor urgent. History has taught them that borders, like everything that exists in time and space, are merely temporary. Running to its western-most limit the U.S./Mexico border fence plunges into the Pacific surf west of Tijuana. Here is the location of Friendship Park, located atop Monument Mesa, inside California’s Border Field State Park to the north and Playas de Tijuana to the south. The park is a meeting place where friends, strangers and loved ones can speak to each other through the vertical bars and mitigate the pain of separation and loss. Over the years, the Park has been the scene of many art performances and media events designed to highlight the border’s history and complex identity as something that both divides and brings people together. In 2012, Mexican artist Ana Teresa Fernandez created a video performance on the Mexican side titled Borrando la Frontera (Erasing the Border). Dressed in a black skirt and black high heel shoes, she climbs up a 30-foot tall ladder and paints the individual metal pickets of the border fence light blue. Little by little, the fence seems to disappear until by the end all that’s left is the image of her hovering in the air as she paints over an empty blue sky where once there was a fence. Fernandez’ black clothing helps to make her visible against the light background but also serves to add a melancholy note as she links it to the funerary symbol of luto, a year-long period of mourning observed in Mexico, in honor of those who have died attempting to cross the border. Borrando la Frontera recalls the surrealist paintings of René Magritte who also used erasure and displacement to express the illusion of reality. “To make of the absurd a metaphysics brought to the simplest acts.”6 The words of Mexican writer Juan Manuel Di Bella seem to hint at the oblique purpose behind Fernandez’s poetically iconoclastic performance. Without physically overcoming the border fence she paints it with the visual marker of its own non-existence and in the process throws into relief the arbitrary and indiscriminate pattern of pain and anguish that grafts it to the earth like a scar. Cyber space has haunted the idea of the border since the early days of the Internet. The development of digital technology into drones, remote cameras and sensors has contributed to more efficient ways of controlling the line. Seen from the other side, these developments have played a distinctly antagonistic role by opening the border to better surveillance while making crossing more difficult. Not surprisingly, homegrown Mexican sci-fi themes have deviated from Hollywood’s brand of spaceships, rockets and invasion plots in favor of those focused on the interplay of labor, economics, religion, politics and human interactions. Following the short-lived boom in science fiction writing in Mexico during the 80s and 90s, moviemakers have recently embraced the genre as a way to explore the border. Peruvian director Alex Rivera’s Sleep Dealer (2009), is the story of Memo Cruz, a young hacker from the Mexican interior, who has his body implanted with nodes that enable him to control robots at remote locations. The film projects the historical experience of the braceros of the 1950s and 1960s into the near future and recasts them as cyber braceros. At the beginning of Sleep Dealer, Memo’s innocent eavesdropping on the drones that protect the privatized dam near his home draws the attention of undisclosed security forces operating out of San Diego. Profiling him as a terrorist threat, they retaliate by launching a missile strike on his ramshackle house, killing his father and forcing him to flee to the border to make money to support his family. In one of the film’s definitive scenes, Memo arrives in Tijuana ready to cross into the U.S. only to be informed the “Border is closed but the network is open.” With the help of Luz, he is introduced into the shady world of the node-enhanced cyber braceros who work 24-hour shifts operating robots that do everything from pick fruit on a California farm to weld I-beams in a Chicago high rise. The film deftly elaborates on borders of technological, biological, economic and political construction. Scenes of Memo receiving his implanted nodes give way to textural and abstract images of liquid flowing across the screen in warm and cool colors. Is it data uploading to the network, the blood moving through his veins or the memory of the river water that once rolled freely by his family’s ranch in the days before multinational interests diverted it? Through this repeated sequence, Rivera hints at the hidden fabric of reality and successfully captures the state of flux and movement, which is at the core of Sleep Dealer. Amy Sanchez and Misael Diaz are the founding members of Cog•nate Collective, a binational art collective whose interventions into the social, cultural and economic exchanges across the Southern California border region are meant to analyze and open up dialogue around these complex relations. For Dialogue in Transit—Evolution of a Line, they organized a mobile conference over pirate-radio frequency 87.9 FM. The conference took place at the Tijuana Port of Entry on Saturday, March 15, 2014, at 12 p.m. from inside a caravan of moving cars. The panelists included Professor and Director of the Chicana/o Studies Department at SDSU, Norma Iglesias Prieto; Professor and Director of the Bi-National Human Rights Center in Tijuana, Victor Clark Alfaro; and Tijuana visual artist and poet Omar Pimienta with Sanchez and Diaz moderating. For the duration of the three-hour border crossing, the group reflected on the changes that have had an impact on the economic and social life of the border since the 1994 North American Free Trade Agreement. Unlike typical conferences, which are spatially static, Dialogue in Transit moves forward in time and space, migrating through the line in unison with the general population of border crossers. Listening to the audio archive of the conference it becomes clear that the life of the city, pouring in from outside, is as much a part of the dialogue as the panelists are themselves. Rolling jauntily along on its pedagogical border trip, the broadcast booth, dubbed the Cog•nate Cruiser, a battered Chevy wagon covered in black and white murals that include cartoons of Zapatista rebels, blasted out its program, looking every bit the rasquache pirate ride. During Part II of Dialogue in Transit, Diaz steers the car off of the line and parks beside an artisan market where the panelists carry on their dialogue with local merchants. Moving towards the “temporal plane of the future,” Part III engages pedestrians to predict the future of the border. Their responses run the gamut from hopes that the border will fall, to doubts that it will ever be brought down. Dialogue in Transit—Evolution of a Line successfully embeds the format of a radio talk show into the experience of driving through the U.S./Mexico port of entry. Its slow-rolling perspective allows it to capture the carnival-like atmosphere of the borderline with its perambulating vendors, strolling musicians and gaping tourists. The static flow of border traffic becomes the perfect opportunity to introduce the free play of a pirate radio broadcast. Even since the 1848 Treaty of Guadalupe Hidalgo decreed the present day border between Mexico and the U.S. as a geo-political reality, the border’s identity has evolved and its legitimacy has often been contested. Social, political and economic forces from both sides manipulated it to fit their own interests. State control over the border has been crucial to maintain claims of national sovereignty and preserve territorial integrity, but the balance of control has always deviated preferentially towards the United States. Nationalized images of the border as sovereign, transcendent and inviolable stand in contrast to its humble origins as a collective work of the imagination—as a line in the sand. Closing the border completely has never been a state priority since it must ultimately allow passage for those who fit within privileged national identities. Yet, in an age where global economic crises continually shock the relations between rich and poor nations, old definitions of the border continue to come under pressure from a variety of sources. 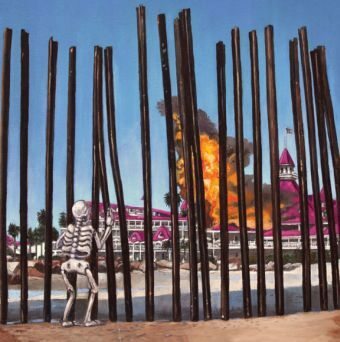 Border artists have been instrumental in developing innovative strategies for contesting official notions of the border as a divider that separates along lines of racial purity, economic privilege, and national identity. The future of post-bordernity can be read in their creative and humane responses and their alternative visions will continue to give way to dialogue, openness, fairness and compassion as long as there are borders to contest.